From a statistical point of view, Washington’s 2017 defense compares favorably with the 1991 defense, considered the best in school history. The 2016 team made a run, reaching the national semifinals before bowing to a superior Alabama in the Peach Bowl in Atlanta. The 2017 team still has a shot at returning to the playoffs if it wins out, but the 13-7 stumble at Arizona State Oct. 14 likely dooms the Huskies, No. 9 in the latest CFP rankings, even if they become conference champions. The 1991 team has become such a storied bunch – it entered the Husky Hall of Fame en masse in 2011 – that comparing other editions to it somehow seems inappropriate. But statistically, the 1991 and 2017 teams — especially the defenses — compare favorably even though the college game today is much different than the one in which Emtman dominated. One major difference since 1991, and especially in the past decade, is the emergence of spread offenses, allowing more teams to score quickly and more often. In 1991, three teams – Fresno State (44.2), Washington (41.9) and Nebraska (41.3) – averaged more than 40 points per game. Eighteen others averaged more than 30. This year, 17 FBS schools average 40 or more and 42 others, including Washington (38.6), average 30 or more. In 1991, the 100th-ranked scoring team, Southern Methodist, averaged 12.8 points. This year’s 100th-ranked team, Vanderbilt, averages nearly twice as many, 23.9. In 1991, three teams – Fresno State (541.91), Pacific (511.25) and Nebraska (506.45) – averaged 500+ yards of total offense. Twenty-four more topped 400. This year, Oklahoma averages 600+ (608), 11 others average 500+, and 54 more 400+. The number of teams averaging at least 400 yards of total offense has more than doubled since 1991. The story is similar in the Pac-12 (Pac-10 in 1991). Back then, three of the 10 schools scored 30+ per game. This year, seven of 12 average 30+. In 1991, three averaged 400 yards of total offense. This year, it’s nine. From all of that, two notions follow: First, the defensive numbers Washington posted in 1991 probably wouldn’t be quite as gaudy today given the profusion of amped-up offenses. Second, this year’s defense, No. 1 in the nation in total defense (240.9 yards per game to No. 2 Alabama’s 243.8) and No. 2 in scoring defense (11.1 to No. 1 Alabama’s 9.8), probably would have even better numbers than it does if matched against 1991 offenses. Since it’s impossible to prove any of that, the following comparison between the 1991 and 2017 defenses is purely for curiosity. Strikingly, the 2017 Huskies are nearly even with the 1991 team in total defense and scoring scoring even though the 2017 team plays in the era of up-tempo offenses. Statistically, the 1991 Huskies had a better run defense, but the 2017 Huskies are better against the pass. 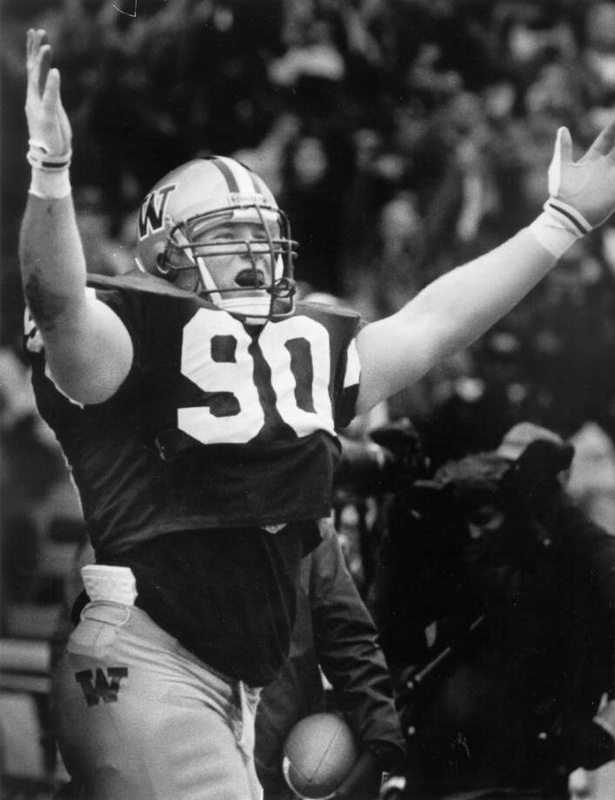 The 1991 Huskies defeated three ranked teams, beating No. 9 Nebraska 36-21 in Lincoln, #7 California 24-17 in Berkeley and No. 4 Michigan 34-14 in the Rose Bowl. In the Nebraska game, Washington trailed 14-6 at halftime, but outscored the Cornhuskers 30-7 in the second half. In the Michigan game, the point differential was narrowed when Tyrone Wheatley of the Wolverines scored a late TD while UW’s defensive starters were out of the game. And with a minute left, Washington reached the Michigan five-yard line, but opted to run out the clock with the third-string quarterback running the offense. The 2017 Huskies played a cupcake non-conference slate, have yet to record a win over a ranked opponent, and probably won’t get a chance to do so until the Apple Cup Nov. 25. The 1991 Huskies faced six opponents that finished with winning records. This year’s Huskies will also face six provided Utah, currently 5-4, finishes above .500. That’s not likely since the Utes still have to play No. 9 Washington and No. 19 Washington State. The 1991 Huskies had only one game in which the opponent finished as close as a touchdown, a 24-17 win in Berkeley against a team that finished 10-2. The 2017 Huskies have that one-TD loss at ASU, which is currently 6-5. The 1991 Huskies won six times by 35 or more points. This year’s Huskies have three such wins. 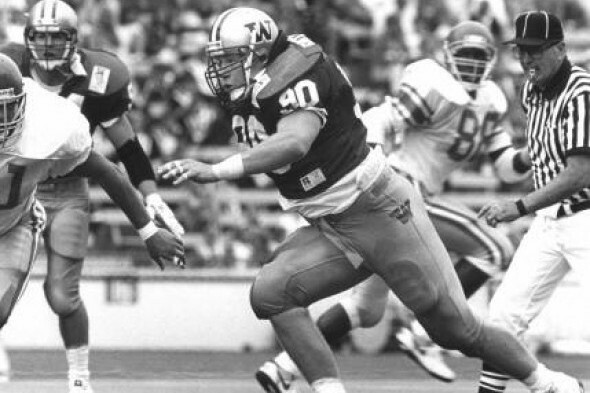 The 1991 Huskies played the nation’s eighth-toughest schedule (107 Division I teams). UW’s strength of schedule this year: 78th out of 130 FBS schools. In 1991, Washington allowed a conference-best 237.1 yards per game, 71.1 better than the Pac-10’s No. 2 team, Arizona State (308.2). This year’s Huskies allow a league-best 240.9, 56.6 better than No. 2 Washington State’s 297.5. The 1991 defense allowed 9.2 points per game, 7.8 better than No. 2 UCLA (17.0). The 2017 team is better than that, allowing 11.1, but 10.2 fewer than No. 2 Stanford (21.3). The 1991 defense featured five NFL draft picks, including first rounders Emtman (Colts) and DB Dana Hall (49ers). No mock draft published so far has a Husky defender going in the first round of the 2018 draft. If this year’s Huskies, who play at Stanford Friday night (7:30 p.m., FS1), had beaten unranked Arizona State, the defense would have had a chance to be considered the best in school history. But with that loss in Tempe, 1991 still serves as the standard against which all are judged. Last and this years teams can’t compete with 1991 but at some point Coach Pete will put together a comparable team. Guaranteed. ’91 had a dominant player (or two) at every level on the defense. Emtman on DL, Jaime Fields (the best collegiate OLB that I have ever seen), and Hall/Bailey as DBs.